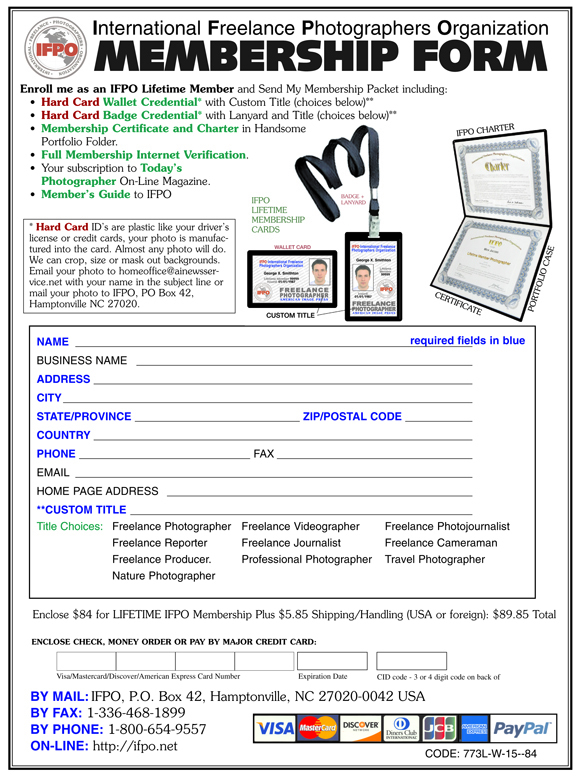 The International Freelance Photographers Organization (IFPO) was founded in 1984. Now, thirty years and more than 82,000 members later, the original mission of IFPO -- to be the primary source of support for the universe of freelance photographers -- has stood the test of time and has surely grown beyond the wildest imaginations of the original founders. Now, Journalists and other Media Professionals are also taking advantage of IFPO's Programs. QUESTIONS? EMAIL Vonda Blackburn homeoffice@ainewsservice.net or call me TOLL FREE 1-800-654-9557. Membership Certificate and Charter in Handsome Portfolio Case. Membership Verification on the Internet. Full Membership Benefits and Privileges. UNIVERSAL ACCEPTANCE: Instant Prestige and Recognition, Proven Unrestricted Track Record, Elite Group of Journalists and Photographers. at Events at All Levels. Effective at opening Toughest Barriers, Gates and Doors.. Arrange Next-Day delivery by calling 1-800-654-9557. Ship today for delivery tomorrow (USA only) via Express Mail. Order and Photo must be in by 1:pm Eastern Time. Next-Day delivery charge is $39. Get Extra Sets of ID Cards by calling 1-800-654-9557. Extra Sets of credentials with initial enrollment are only $19.95. Get Extra Sets with different Titles. Keep extra sets in your vehicles or with your equipment. Call 1-800-654-9557 if you are enrolling 2 or more individuals at the same time. Networking creates Opportunities, Assignments and Jobs. Using Credentials creates Networking. When you use your ID Cards, you will be interacting with media pros and decision-makers. at Hotels and Accomodations, Airlines, Car Rentals and other Transportation, Government Offices, Theme Parks and Recreation Facilities.